We are happy to present you a novelty - eKapija Android application, which is unique in our market in terms of contents, user friendliness and features. The contents of this app are available to you at any time and any place, even when you don`t have access to Internet. We`ve made it possible for you to read business news when you`re offline, so that with occasional updates, business news from our web portal are available even to those who don`t have an active Internet connection on their Android device. We especially take pride in giving you a possibility to receive notifications directly to your phone about tenders and events the moment they are published, all in line with your business and interests. In order to "browse" through contents and try all attractive features of the application, it is necessary that you know your username and password. If you forgot them and need assistance, just mail us to marketing@ekapija.com. 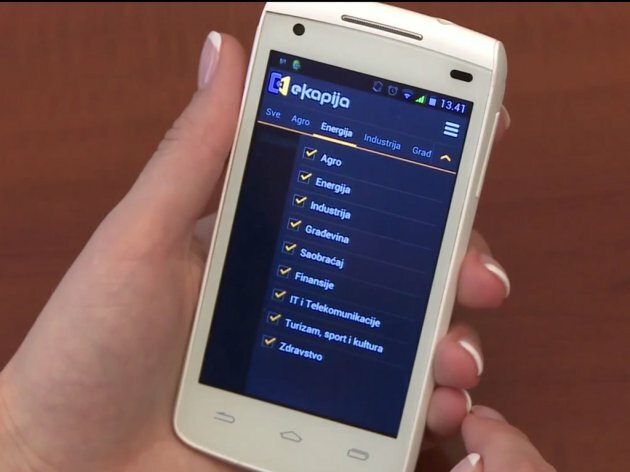 The eKapija application is divided into five sections: News, eKapija plus, Events, Tenders, and Companies. The overview of the latest business news is available per industries, and you can also choose to get only the news from the industries that are in direct connection with your core activity. In the eKapija plus section, you will find interviews, articles related to your personal finance, biographies of the people you already work or you are going to work with, as well as stories about people in the public spotlight. Here you will also find our After Work articles. Our new app will also allow you to browse through tenders and public procurements and to download tender documentation. Since you got used to utilizing our web portal to find information on companies - competition, prospective and long-term partners, our new Android application will allow you to browse through a unique Directory of Companies and gain insight into companies` activities and finance. Our IT partner on this project was Intellex d.o.o. from Belgrade. eKapija`s Android app is available at Google Play Store market, where you can download it for free. You can also download it right away by scanning the QR code in the photo. Much more details about this app can be found at https://www.youtube.com/watch?v=AtPuI7p-nS8. We would be really grateful if you shared your impressions of our application. You are kindly asked to send all comments, proposals and suggestions to pr@ekapija.com.